Drupal is awesome. Drupal is flexible. But Drupal is also hard. If you’re just starting off developing with Drupal or have gone through a handful Drupal projects, it’s OK to feel lost. We’ve all been there. The stages to getting through the difficult times with Drupal are remarkably similar to the well-known Kubler-Ross model for dealing with grief. Does that mean that Drupal is the same as grief? Not necessarily. While actual grief of a loved one is a serious matter, sometimes fighting through initial challenges yields rewards far exceeding your expectations. Even more, the similarities for dealing with the complexities of Drupal development and for dealing with grief are uncanny. The tips I’ll share with you are aimed at web developers interested in becoming professionally proficient with Drupal. 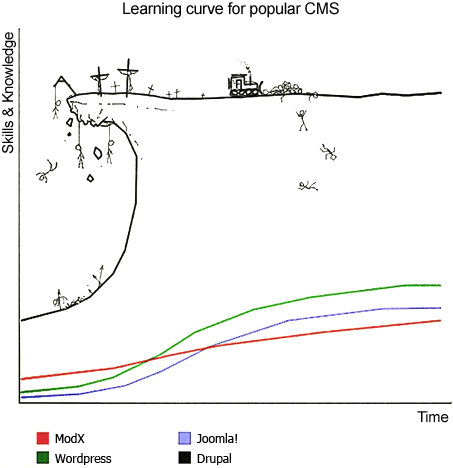 The Drupal learning curve is often regarded as difficult, and rightfully so. Your first challenge is to get over your denial and accept this reality. One shock for developers comes from the vast Drupal glossary of terms that you must understand to do a lot of the complex tasks. Once you’ve committed to developing on Drupal, certain aspects may seem a bit over your head. Never fear, however, as our trusty friend Google can often get us out of traps. While a good amount of quality answers from search results point to StackOverflow or StackExchange, the best resource for dealing with the pain is the robust Drupal API documentation. If you’re more of a visual learner, the excellent Drupalize.me series by Lullabot is a gold mine. So you’ve resolved yourself to conquering Drupal, and the complexity of it is slowly revealing itself. The “Drupal way” begins to dominate your lexicon as you balance between solving a problem with a quick solution or solving a problem with the most flexible solution. The Drupal framework, like most web development frameworks, almost always offers ten ways of completing one task. At first glance, this choice and flexibility seems awesome. In reality, analysis paralysis sets in as we are presented with too many options. As you get really good at implementing solutions to simpler problems, the chaining of methods to conquer more complex issues starts to introduce doubt within you. You look at your code, your comments, and your TODO notes and give an exasperated chuckle. While the feeling is normal, you may begin to stare off into space while holding your Pro Drupal Development book in your hands, a book which you have probably already purchased by this stage. If you can hold on for a little while longer and have a bit of faith, your “aha” moment is just around the corner. The rhythm of explaining the inner workings of the entity infrastructure, the menu system, and the various permissions schemes yields positive results from clients. Even more, you’ve bookmarked the Drupal 7 API in your browser and begin to find really helpful functions that save you a ton of time. Beautiful designs in custom themes begin to play nicely with unique features in custom modules. Now that you have two feet firmly planted under you, the question of “What’s next?” prompts a smile. The revelation of the true beauty of Drupal is in its community. It offers opportunities to contribute to Drupal documentation, help other developers going through their 7 stages of Drupal’s learning curve, or contribute code back to the Drupal ecosystem in the form of a contributed module or theme. You feel comfortable sharing your triumphs and failures while also encouraging others to stick with it. The death star of doubt has been destroyed! As you hold hands with your project team basking in your awesome accomplishment, you suddenly realize that it wasn’t so bad. Even more, you take pride in sticking with it. Drupal is hard, but Drupal is awesome. While the Drupal 7 mountain may have your flag planted on its summit, never forget that it’s about the journey, not the destination. In that vein, take a deep breath because Drupal 8 could use your help! For more in-depth analysis of these stages and to see code examples, check out my slides from Twin Cities Drupalcamp.